Shouldn’t the sea turtles be out in the ocean? 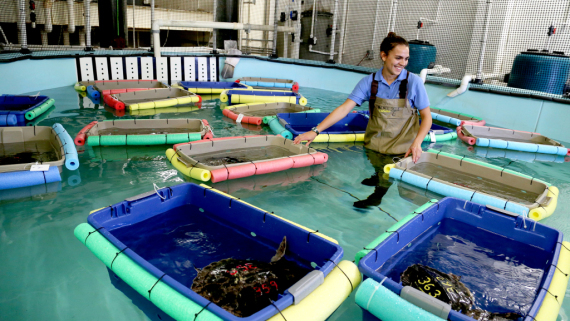 The N.C. Aquarium at Fort Fisher receives a permit from the NC Wildlife Resources Commission to care for two sea turtle hatchlings for a year. These hatchlings were found at the bottom of their nest 72 hours after the nest first hatched. If they had not been found, these turtles would most likely have been eaten by a predator like a bird or raccoon. By keeping these hatchlings for a year, we give them a head start they would not otherwise recieve. 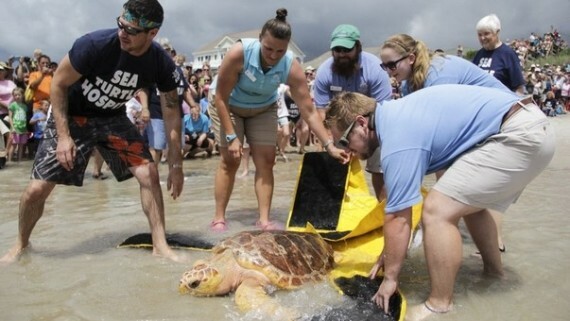 After a year in our care, they are released back into the ocean. 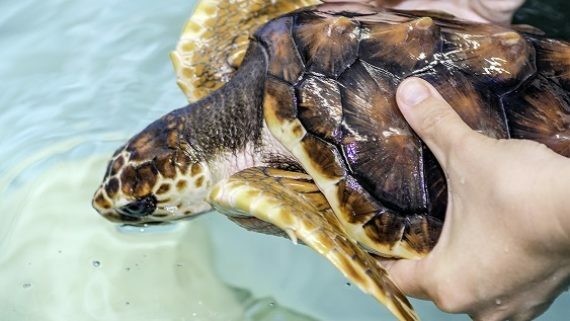 How do the sea turtles know how to fend for themselves in the ocean after being taken care of for a year? Our hatchlings are monitored closely by animal care staff and veterinarians. Before they are released into the ocean, we make sure they are able to dive, catch and eat live food, and are given physical exams by vets. Aren’t the sea turtles lonely by themselves? Sea turtles are actually solitary animals. They hatch from their eggs with their sisters and brothers. Yet, once they reach the ocean, they generally swim and live alone, except when mating. How long can the sea turtle hold its breath for? 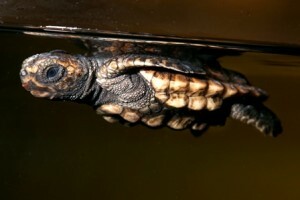 Many times the sea turtle hatchlings like to stay underwater hidden beneath the coral in its exhibit. We have timed hatchlings underwater for an average of 15 minutes. However, as sea turtles grow larger they are able to hold their breath for even longer amounts of time. 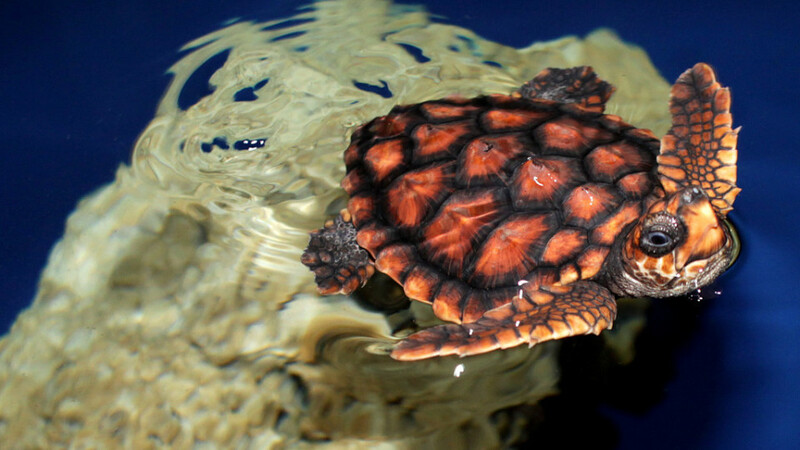 If a sea turtle is fully grown and not moving around a lot, it can rest underwater for several hours. Do we know if the sea turtle hatchlings are females or males? No, we do not. When sea turtles are hatchlings, the males and females look alike. Finding out can be expensive and invasive, requiring blood work. When sea turtles mature and grow older, it is much easier to physically tell. The males tend to have longer tails than the females. What are the sea turtles’ names? The hatchlings don’t have names like you would name your pet. We name them Turtle A and Turtle B in order to tell them apart from one another. We don’t want to think of them as pets. They are a threatened animal species in our care only for a year and then they will be released into the ocean. However, if your class or group wanted to adopt one of our hatchlings, you can absolutely give your adopted sea turtle a name. 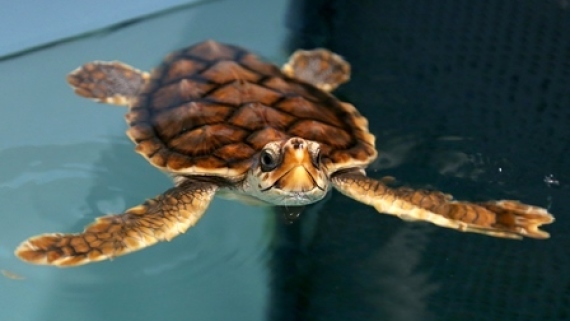 Click here for more information on adopting a sea turtle. Why do they put their front flippers on top of their shell and stay still? Oftentimes, the hatchlings like to float on top of the water with their front flippers folded behind their shell, or carapace. They usually stay very still when they do this. This is an instinctive behavior shown by juvenile sea turtles living in the Sargasso Sea. There, they would float among the sargassum seaweed and blend in with their habitat on the water surface to rest, hide and find food. 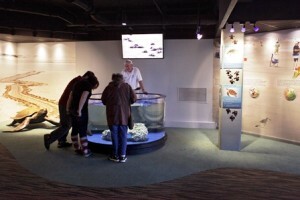 If you can think of other questions you may have about our sea turtle exhibit, feel free to share them with us. 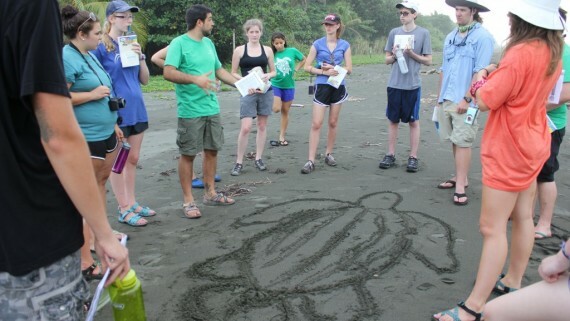 Our current sea turtle ambassadors continue to grow! This week, Turtle A is 16.6 cm long and weighs 721 grams and Turtle B is 15.6 cm long and weights 625 grams. Not sure what to do with this weight and length? Learn more in our Hatchling to Yearling lesson plan.We will take a short break next week and be back the week after!